As soon as the Thanksgiving groaning board is cleared and the dishes are washed and dried, American peeps are thinking about our next secular holiday – Black Friday. Personally, I never had time to get up at 0 Dark Hundred o’clock to check out the 60% discounts at big box stores. We were too busy preparing for the Old Town Boutique District’s Anti-Black Friday festivities, which were called Plaid Friday. Old Town is obsessed with all things Scottish, and we usher in the holiday season with a parade of kilt-plaid clad humans and tan-wearing Westies. So, the mood is set. Plaid Fridays were exhausting, but lots of fun, with a great sense of community. Breakfast places and coffee shops all participated, with the free trolley taking people up and down King Street to enjoy a variety of discounts and treats, beautiful street decor, and windows to peer through. Lovely as this is, there is lots to be said for choosing a gift that has something going for it besides a steep discount. And so with this post we put together some of our favorites for Kitchen Detail readers. The first thought is a delightful and meaningful cookbook written by the women of The Hubb Community Center in London. Think back to the horrific fire in the Grenfell Tower, in which 71 lives were lost. Since the disaster, survivors have been housed in a variety of hotels without kitchen facilities. While their lives are on hold, some grouped together at the Al Manaar Muslim Cultural Heritage Centre, and secured funds to open a twice-weekly kitchen so that they could serve meals to the displaced community. Meghan Markle recognized the need for additional funds to keep the kitchen open more than just two days a week. She used her muscle and PR know-how to get this book published under the auspices of the RoyalFoundation. The recipes are simple and can introduce your family and friends to new palates. Already, I’ve woven several recipes from this collection into my repetoire. I purchased it when the long red peppers were in the farmers’ market stalls and Together‘s version of them stuffed with cheese is easy and delish. A caramelized plum upside-down cake or the rainbow raosted vegetables along with the green chile and avocado dip should be on your checklist too. Take a look at the video and know that your purchase of this delightful cookbook will help keep this true community kitchen open though the proceeds from its sales. Are you asked to carve the Thanksgiving Turkey, the Christmas Roast, the New Year’s Ham? Do you gnash your teeth while watching (or worse, having to do it yourself) someone hacking away with a dull knife? Give these people a gift certificate from Precision Knife Sharpening Service. It is superb resource for this pesky task. You or the recipient can ship your knives to them, and they will ship them back, lethally sharp. Or, if you live in our neighborhood of make-believe, drop them off and pick them up when you get the email that your knives are ready. Check out their website for the possibilities. As you can see from our “In My Neighborhood” post (which was one of the most widely shared by KD readers), Dave knows how to sharpen properly and can probably rescue knives you thought were beyond help. If you have not already taken advantage of their first-timers’ coupon for KD readers, now is the time to do it. But you likely have friends who are in desperate need, who deserve a gift certificate for knife sharpening. I have taken my knives to several places for test sharpening and this neighborhood service is the best. which he is not allowed to touch. The Thermapen is a probe for spot-checking, whereas the ChefAlarm is a detachable floating probe that can be put in the oven, inserted in your poultry or roast. You can set the desired tempeature on the timer/thermometer, and when it is reached, the alarm will ring. I realized only recently that every time the oven door opens, the temperature can drop by 50°F (28°C). This should discourage inveterate peekers. Decreased oven temperatures will inevitably extend the cooking time of your roast, be it a tenderloin or a turkey. The timer can be used independently of the probe and also be attached magnetically to a surface or sit on a shelf or counter. Click our link to their website to go through to the special Black Friday through Cyber Monday discounts that they offer on their Thermapen Mk4s, ChefAlarms, Classic Thermapens, and Smoke. This American-made company, which for over 181 years has had its roots in western Massachusetts, was featured in one of our “Superior Sources” posts. Lots of our readers got the slotted turner that we think is the most useful stovetop accessory, and we received feedback that it found a permanent home by their stoves too. What I love about Lamson tools is that they are well crafted in their factory here in the US. Parts for their tools are not parceled out in a reverse bidding process to overseas manufacturers. Their tools and knives have several handle options. And their lifetime warranty on Lamson products is rigorously honored, unlike some manufacturers I have dealt with. Lamson Products has very generously offered a 40% discount on their kitchen tools with the POM Handle (POM Handles are more dishwasher friendly) to Kitchen Detail readers. This code can be used more than one time, but cannot be combined with other discounts offered by Lamson. All items are subject to availability and Lamson reserves the right to cancel orders for items that are out of production. Please use the following code KDPOM18 in the coupon field when you check out with your gift choices (hopefully there will be some for yourself too). We believe that the Wellness Mats Company manufactures the best floor mats for anyone slaving over a hot stove or even simply standing by a microwave. Our feet, ankles and knees thank us every time. And if you have denied yourself the relief and comfort of these mats , now is the time to pull out your credit card. Wellness Mats ia offering through its dealers, or directly on their website, a 20% discount on any mat until November23, and then 30% off Black Friday weekend, including custom mats. Their mats are all latex-free, non-slip, and have a trip-free, 3/4 inch, beveled edge. From my own experience, they are so, so easy to clean, and 100% made in the USA. They make wonderful mats for doggies (Nikka, the nervous wreck German Shepherd rescue we had in the shop, loves hers). These mats are hypo-allergenic, plus they are odor-resistant too. Wellness also produces its mats for yoga and Pilates workouts, which will become a necessity for some of us after the holidays. The variety of colors and patterns available is unbelievable. Special sizes and “L” shaped mats can be designed up to 16 feet. Runner series can be made from 7.5 feet to 9.5 feet in either 2-foot or 3- foot widths. Their promotional pricing includes custom PuzzlePiece orders. All mats come with a 20-year warranty, which is longer than the guarantee you get for a knee replacement. 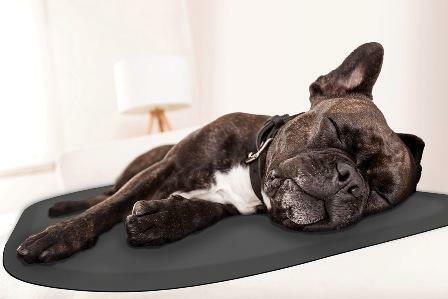 Applicable sales tax will be added, but if the mat you choose is over $100.00, there is free ground shipping in the Continental US (if you order directly from WellnessMats.com). remain two of my non-corker favorites. The designer (who is not so very interested in wine) wanted to come up with a little giftlet to accompany a bottle of wine. He fiddled with a cork, putting on a cowboy hat and pushpin eyes, and voila, a brilliant idea was born! Monkey Business has offered a 10% discount to KD readers on any order $50.00 and over. Use the code MBLACUISINEUS when you check out from their website. done for this round. It is a famous mistake by a senior bartender, Mirko Stocchetto at Bar Basso in Milan in 1972 – the Negroni Sbagliato or Messed Up Negroni. A Negroni is normally made with Gin, Campari and Vermouth. but Mirko accidentally grabbed a bottle of ProSecco instead of gin. I adore this mistake! I can make this with my eyes closed: 1 part (1oz/3cl) Campari, 1 part (1oz/3cl) Red Vermouth, topped off with ProSecco over ice. I like it on the rocks and then garnished with a slice of orange, which I always eat just for the extra Vitamin C. Never too soon to work on a healthy New Year! See our full recipe for Negroni Sbagliato here.